Pin it! GAPS recipe for tomato soup. Pin it! Healing tomato soup. In a large pot over high head, add the ghee. When it's melted, add the onions and sauté until translucent. Turn the heat down to medium-high. In a high powered blender (I used a vitamix), blend the tomatoes, carrots and celery and add to the pot. Add the broth, cover, and turn the heat down to low-medium, allowing the soup to cook 30 minutes. Then, add the garlic and herbs, and cook 10 more minutes. To serve, transfer one serving size to the blender and blend for about a minute (this just gives it a whipped consistency, you could skip this part if you don't care about texture), and serve immediately with a dollop of sour cream. 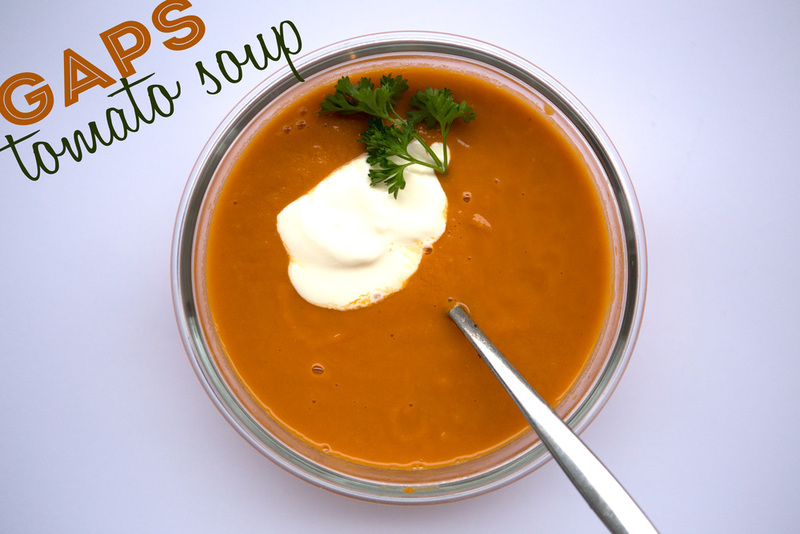 PS- More healthy soups recipes.